DON’T THINK POPE FRANCIS needs my words to defend him, because he would know very well how to do it himself. Also, to be honest, while I cannot say that I agree on everything he is doing, in general I believe that he deserves a deep respect for his actions. Before continuing, I must ask my readers to avoid a very big mistake that is quite common in Catholic literature, the belief that if you defend Pope Francis it means you are against Pope emeritus Benedict XVI, and that if you exalt Benedict XVI it means you hate Pope Francis; neither of which is true my case. If you read my posts here and in other places, or my books and articles, you immediately will feel that I belong to the side of Benedict. Indeed I have a deep admiration and respect for him, and his ideas have influenced me a lot. This will never change. However, I realize that to put the two popes one against the other is a nonsense, as they address different problems in our society, with a different perspective and with a different worldview and background. They have different interests and priorities, and this is shown in their pastoral action. 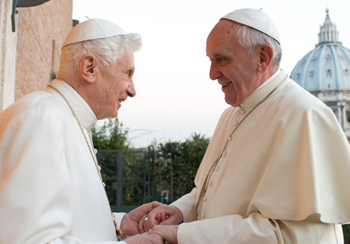 First we face the issue of liturgy; of course Pope Benedict was very sensitive on this issue, being a lover of beauty as expressed in Catholic Tradition, a lover of music and art; this makes me feel, even now, still very close to him. My book “Il canto dei Secoli” was described by a theologian very close to Pope Benedict XVI’s teachings as deeply influenced by the thinking of the German Pope. I confirm, and still now confront myself with this great Pope. Pope Francis is a man of deep faith but the reflection about the issues surrounding liturgy is not among his priorities. He wants again to show the mercy of Jesus in a very troubled world, and is doing this with his actions, that of course are very easily misunderstood. At present, it seems he hasn’t changed anything spectacular in the liturgy, with the exception of the document about the sign of peace, that indeed was not seen with favor from progressive liturgists. Jorge Mario Bergoglio was used to visiting the very poor in the slums of Buenos Aires and so has seen the deep frailty of our humanity. This is why I like his phrase, about the Church being a “field hospital,” because we are all weak and in need of help and forgiveness. We are all burdened with sins and we need understanding together with the need to find the right way. Cardinal Newman has said that “we are going to heaven backward”; yes, despite our efforts and a few exceptional models in the saints, we should be honest with ourselves and recognize our weak nature and our need for help, help where we are (the field hospital), to be reached where our sins most hurt. I hope I am not mistaken when I say that Pope Francis is acting in this direction in his own peculiar way; of course, being himself a sinner too (as he defines himself when asked by an Italian journalist) he may also misread situations and commit mistakes. In that occasion we can only hope that the words of Jesus, “Tu es Petrus,” will be for him the best cure and will be enough to restore his spirit and help him in the titanic mission of giving to a lost world the only hope that can still save it.